31 available	 Tap Takeover Songwriters Circle $15.00 TICKETS WILL BE EMAILED. Non-refundable. Assigned Seating - Please note that you may be seated with someone that is not included in your party. Cheers! 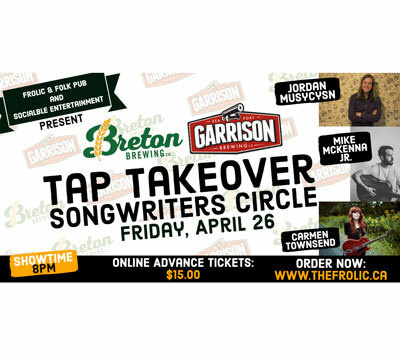 Come sample some of Breton Brewing & Garrison Brewing’s famous offerings, whilst being entertained by Cape Breton’s own Jordan Musycysn, Mike McKenna Jr, & Carmen Townsend, in an intimate setting where they will reveal the mystery behind the process of turning stories into songs and music. Prizes to be won as well!